Take advantage of this before I change my mind. Confession: I am a selfish child who hates to share. When I find something I love, I keep it to myself… it’s horrible, I know, but it’s my nature. Like, you know when babies are learning to eat real food and they kind of obsess about it 24/7 and HAVE to eat whatever you’re eating? Most people are all, “Here you go, baby! *gigglelaughsnort* I looove sharing my food with babies!” Me? No. Maddie does that to me every day, and each time I have to hand over a bite of my delicious meal I feel like she’s taking a part of my soul along with it, covering it in drool and leaving it for me to clean up approximately 4 hours later. It makes my eye twitch a little. I only do it because I love her. And only give her the tiniest of bites because the rest is for me, dang it. It’s an issue. With that little nugget of information, you may now understand why it is taking every last ounce of strength in my selfish little body to write this post. It’s just that I’m sort of obsessed with this new online boutique I discovered a few weeks ago and I was seriously contemplating keeping it all to myself, BUT in the spirit of kindness, adorable dresses and discount codes, I feel it is my duty to share this with all of you. Do you SEE the adorableness that is going on here? All the girlieness? All the RUFFLES? And the best part is how affordable all the items are. I die. 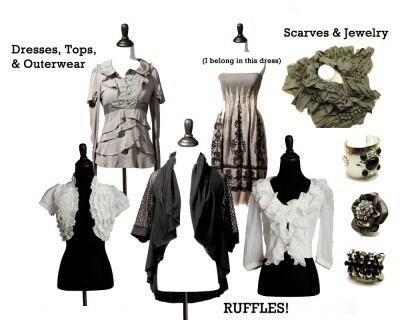 Go check out Twisted Simplicity and check out the rest of the cuteness and RUFFLES! for yourself. Twisted Simplicity is offering my readers a 10% discount when you use the code “mrspriss10”, available until February 15, 2010. Also, if you become a fan on their Facebook page, you’ll have a chance to win a $40 gift card. Tina, you are hilarious. Absolutely loved Baby Mama. And I’m digging the nautical-esque look you have going on here. Can I please copy this general idea, but spend about $2,000 less? Okay, thanks. So, here’s another celebrity-inspired outfit for a fraction of what the original items cost. Let me know what you all think, and if you have enough time, explore Polyvore and try to beat my deal!